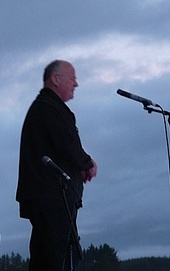 Tá coirm Mhór again le Christy Moore oiche Dé Domhnaigh 7?7/2013 san Abbey Hotle Baile Mhuirne chun airigead a bhailiú. Beidh crannchur mór ann chomh maith agus beidh Seán Sé agus Cor Chúil Aodha ann chun an tig a théamh do Rí na mBárd é féin. We are having a big concert with Christy Moore to fundraise for teh activities of teh IOntaoibheas on Sunday the 7/7/2013. It will be in the Abbey Hotel in Baile Mhuirne and will start with a big raffle as Seán Sé and Cór Cúil Aodha warm the house for the King of the Bards himself, the Maestro Chrusty Moore. Tickets are €40.00 and can be purchased here or at the Abbey Hotel.